How safe are batteries in modern EVs anyway? The owner of a Tesla Model S was killed in a terrible crash this past Sunday as he was travelling on South Flamingo road in Davie, Florida. According to a report by Forbes, the driver, Omar Awan appears to have veered off the road for no apparent reason, spearing across three lanes of traffic and crashing into trees in the median. Police spokesman Sergeant Mark Leone said that investigators do not know whether the accident occurred because of a vehicle malfunction or if Mr. Awan had suffered some sort of health-related issue just before losing control. (The images in this report are not from this accident). Witnesses stated that the car looked to be traveling well above the 50mph speed limit posted on that stretch of road, estimates were between 75mph and 90mph, although it would be difficult to know for certain until the investigation is concluded. One of the people interviewed said that attempts to get the driver out of the vehicle were thwarted by the extreme heat and the lack of a door handle to pull on. The statement is not unexpected and while it is true that any type of car can catch fire following a collision, chemical fires caused by damaged battery packs can reignite and continue burning for up to 24-hours after the accident. This is exactly what happened in this case as the battery pack reignited three times while the car sat in the towing yard. It is not an isolated incident either. Tesla has had some problems with its cars catching fire in the past and have since strengthened the metal casing surrounding the batteries but in extreme cases like this one the potential for any car, EV or not, is there for it to erupt in a fiery blaze. 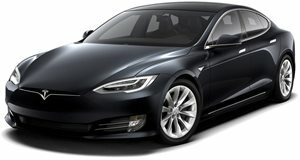 Tesla’s own Emergency Response Guide suggests that cars that have had their high-voltage batteries compromised should be stored 50 feet away from anything flammable. It is also worth noting that not all accidents involving EVs automatically result in an uncontrollable fire, but clearly there is still work to be done before the battery packs can stand up to serious accident damage.